Get rid of weeds automatically! Feel the sand beneath your feet! The LAKEMAID® is a lightweight lake weed and muck removal machine unlike other removal tools and cutters. 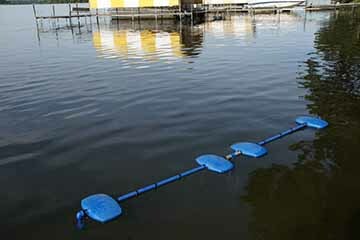 Easy to install and easy to move, the LAKEMAID® attaches to your dock and effectively removes pond and lake weeds near docks and in swimming areas by dragging weed-removing rakes across the lake bottom. Great results in just 24 hours! The LAKEMAID® was tested by the San Francisco Estuary Institute on the San Joaquin River Delta. Their report states, "plant biomass went down to almost zero at the end of the 10 day study period." They went on to state, "The LAKEMAID® can be cost-effective for treating very small areas of plant infestations." Click here to read the full article. Click here for additional information - Before and After Photos, etc. Click here to view the LAKEMAID® sizing chart. Talk to one of our LAKEMAID® experts at 1-877-428-8898. The LAKEMAID® is the ultimate automatic pond weed removal machine. It consists of a dock mount, and a long floating arm propelled by a submerged pump that drags weed-removing rakes across the lake bottom. 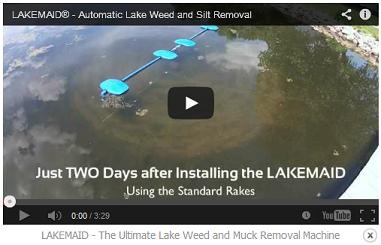 This repetitive sweeping action eliminates lake weeds quickly and safely. Not only is the LAKEMAID® tool an amazing machine for lake weed removal, it's also perfect for preventing the build-up of silt. You can request a free brochure about the LAKEMAID®. Evaluating Impacts of Lake Maid™ Plant Control. Journal of Aquatic Plant Management, 44. Lake Restoration ships the LAKEMAID® for a flat fee of $69. Canada Shipping: Canada Customs requires Canadian recipients to pay applicable duties and taxes on each shipment enter Canada. For more information on shipping items to Canada, please see our Shipping Information page. Had my unit for a month now and it will not pump clean water. Trying to contact Lakemaid to resolve this matter with no success. Waiting for them to return or answer my call. Good news it does remove weeds. Bad news is if the weeds are heavy, the weeds pull the cord and this gets tangled in the chains. It is difficult to anchor the system especially in deeper water. It is such a pleasure to swim enjoying the nice sandy bottom of the lake vs. prior to having the Lakemaid we had to swim in the weeds! The equipment is not difficult to install and once that is completed, we can forget it and just watch the efficiency of the Lakemaid. I especially like the free standing unit and not having it attached to the dock. The equipment is not heavy for installation and also stores nice for the winter. We were really excited to try this product. So... the unit twisted up no matter what you did, making the cord cover way too short. It got blown in no matter how heavy you made the anchor. When it hit weeds, even with the chains shortened, it stopped turning (& if it's on a slope, the chains are either too long or too short). The finishing chains gouge deep channels, in our case merely moving the silt over a bit. The connections corroded after a couple of weeks, making it very difficult to get apart or together. We got the larger one- it was quite expensive & has been just sitting in our back yard for the last 2 years- we so wish we had not gone this route! !